Peking Man or Beijing Man was a previously unknown type of Prehistoric man discovered by Canadian anatomist Davidson Black in a cave at Zhoukoudian, China in 1927. Between then and 1937, 14 partial craniums, 11 lower jaws, many teeth, and skeletal bones were found at the site. It is believed that the cave was home to about 45 individuals. From extensive studies of the remains made by Black and his predecessor German anatomist Franz Weidenreich, we know that Peking Man stood erect, made stone tools, understood how to use fire, had a heavy brow ridge and large teeth. In 1941, while being shipped to the United States for safety during World War II, the original fossils disappeared and have yet to be found. However, casts and descriptions remain and since the end of the war, other Peking Man fossils have been found at the site and at other sites throughout China. Before Black had uncovered Peking Man, many scholars believed that the remains of Java Man were actually the remains of a deformed ape. 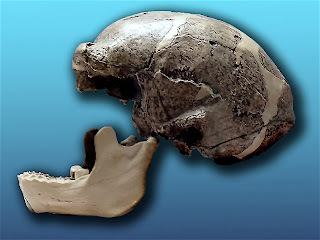 The finding of tool usage and fire at Zhoukoudian proved that both Java Man and Peking Man were members of the same broad stage of human evolution and thus filled out the edges of our evolutionary picture.